Visualization of data on software structure and related temporal activity supports the analysis of correlations between the two data types. This is typically done by linked views. This has shortcomings with respect to efficient space usage. Also, mapping the effect of user input in one view into the other view is difficult. We propose a novel, space-efficient technique that fuses the structure and activity spaces in one view. We created ViewFusion, a prototype tool, for the understanding of program static structure and execution traces based on this technique. 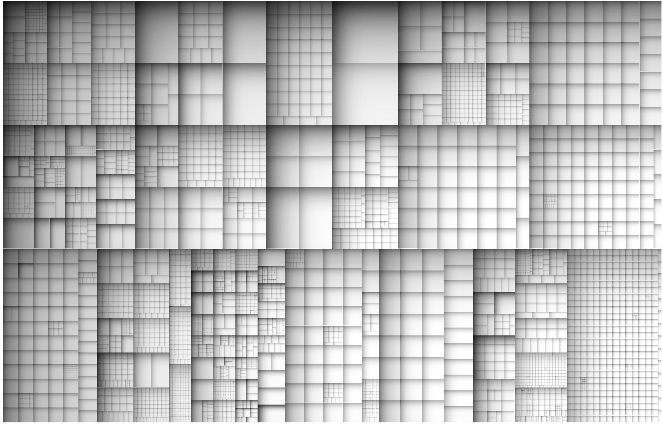 For structure data, we use a classical squarified cushion treemap. We propose a new implementation which approximates well the , and can be efficiently implemented using single-pass OpenGL 1.1 rendering. 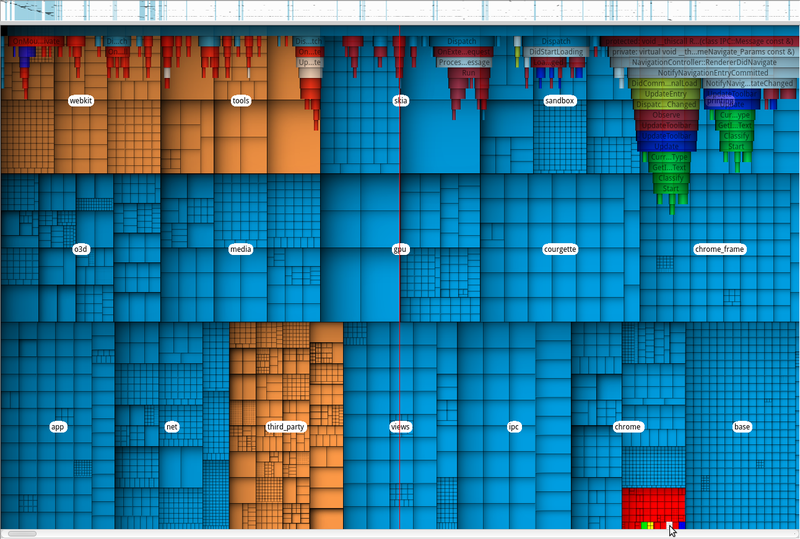 This yields real-time performance for hierarchies of (tens of) thousands of elements on consumer graphics cards. 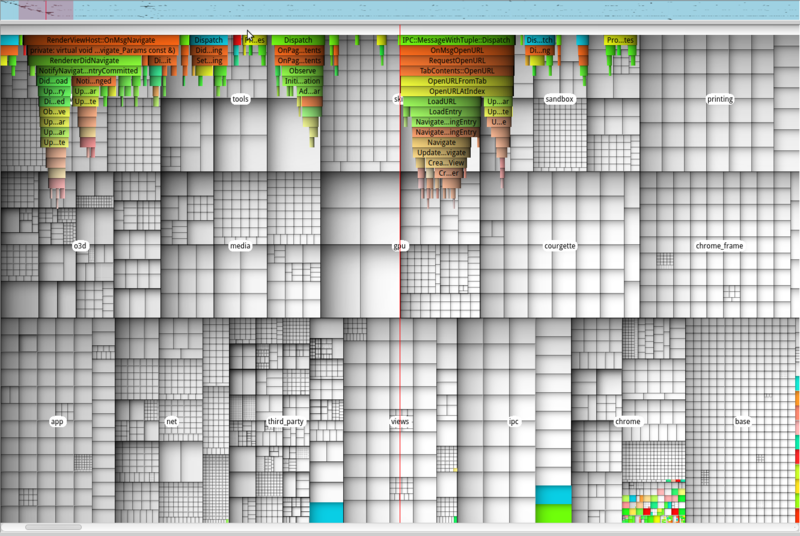 The snapshot below shows a treemap for a software hierarchy of 8850 elements. Dynamic data is given in our case by execution traces, which are sets of function calls (function ID, caller, and call start and end times). Such traces can contain (hundreds of) thousands of calls. 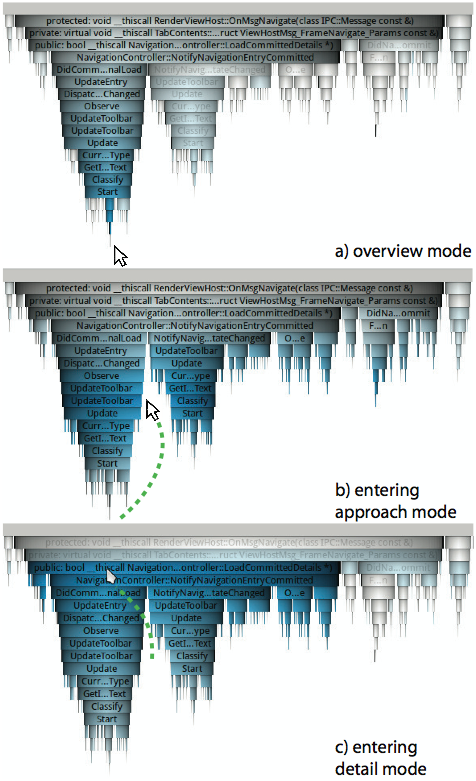 We visualize traces using the classical icicle plot metaphor, augmented with cushion shading to emphasize execution structure. The view can be zoomed and panned interactively. 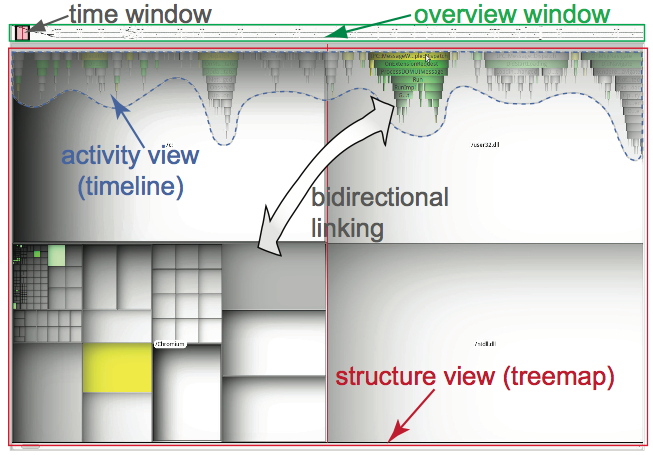 We next use shading linked to mouse interaction to convey the focus of interest and declutter the activity view. detail: the mouse is inside a call-stack. We highlight this stack. Elements in both views can also be colored by various metrics, such as package ID, call duration, call stack depth, number of callers/callees, and static quality metrics. This allows further correlating structural and activity information. 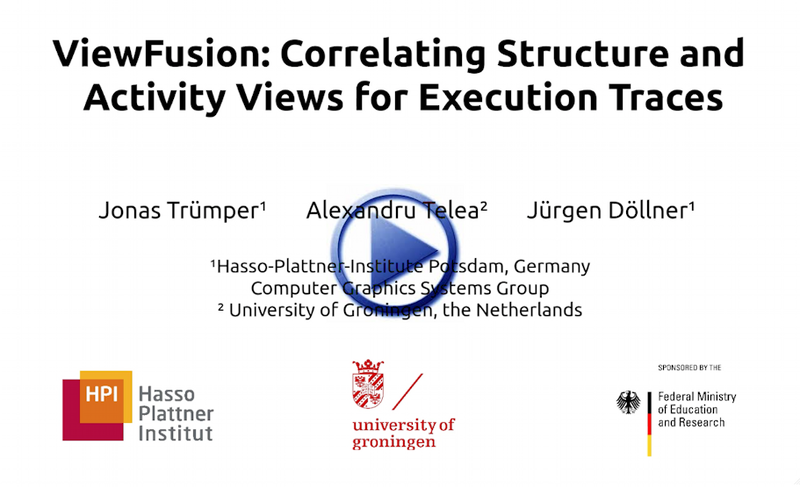 We recorded an execution of and analyzed it with our ViewFusion tool (8850 files and folders, 2.7 MLOC C/C++). The videos below illustrate this on a pre-filtered trace containing about 9000 calls to 920 function bodies (RuG link, HPI link). Note: If the video (MP4 format) does not play in the browser, download it and play it locally. You can also check out and comment on our work on YouTube!